REFLECTIONS in Alaska Yacht Charter - Master Stateroom with King Bed. REFLECTIONS in Alaska Yacht Charter - Master Bathroom with Shower. REFLECTIONS in Alaska Yacht Charter - Port Twin Cabin with two single beds and ensuite bathroom. REFLECTIONS in Alaska Yacht Charter - Enclosed Flybridge on the top deck for comfort in any weather. REFLECTIONS in Alaska Yacht Charter - Open Top Deck Outside Seating. Ideal for 6 guests in 3 guest staterooms. Families of 7 or 8 guests have been accommodated by special agreement - please inquire. Master stateroom with King size bed and ensuite bathroom with shower and toilet. 2 Guest staterooms, each with 2 twin beds and ensuite bathroom with shower and toilet. 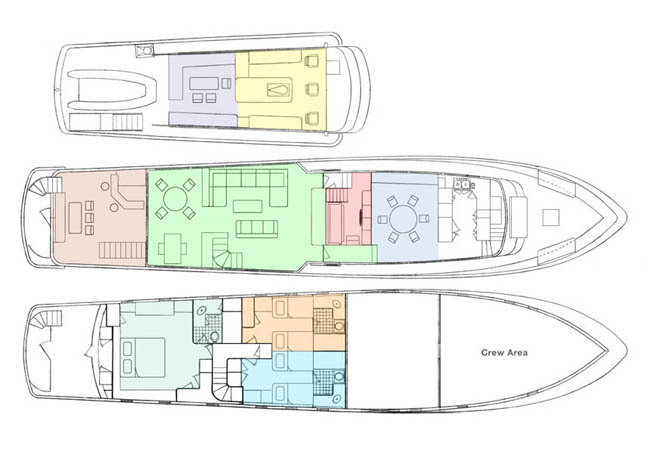 Aft Main Deck and Forward Upper Deck areas may be fully enclosed for comfort in any weather. Crew have separate quarters forward. Communicate: Guests who would like internet and email may bring their own cellular data cards, or have their devices set to use cellular data. Guest Smoke: No smoking allowed. A charter aboard Motor Yacht REFLECTIONS allows you the opportunity to experience and explore the Pacific NW with an elite, highly trained crew of 4, all versed in the standards of yacht etiquette. All crew are non-smokers. Captain Eric Olsen is vastly experienced in the waters of SE Alaska. He is a passionate naturalist, birder, and photographer. His approach? “Creating a memorable experience for my guests has always come naturally to me. Building relationships and loving what you do will consistently bring guests back for more.” For 5 summers 2012 through 2016, Eric was Captain of a 157’ Expedition Ship running 20 naturalist trips per summer between Sitka and Juneau. He hired and managed 12 crew for those adventures. Previous to that, Eric was Marine Operations Manager at Kenai Fjords Tours for 5 years for their fleet of 11 vessels. He supervised a seasonal crew of 75. Eric's experience at sea began with 20 years of commercial fishing in Alaska, and he holds a 200 ton Master license from the United States Coast Guard. An alternate Captain will run some charters. Jessica has been working professionally as a chef for 18 years, with the last 6 summers on a charter yacht in SE Alaska. She has a passion for the culinary arts and a knowledge of basic bartending. She enjoys making sure guests are comfortable and that they have wonderful experiences. Brendan hails from Rhode Island and developed a love for the water at an early age, growing up on Narragansett Bay. Brendan studied Economics at University of Rhode Island but always felt the lure of the ocean. For several years he’s been working on crewed yachts. Brendan holds a U.S. Coast Guard 100 Ton Masters License and is a Certified PADI Open Water Diver. His spare time is spent scuba diving, free diving and travelling to experience other cultures. Brendan is excited to be part of the REFLECTIONS team. Dianne has over a decade of yachting experience on motor yachts to 165'. Her studies included the American Yacht Institute Professional Stewardess Course and Silver Service Yachting Training. Other Entertain: In Alaska, satellite television may not be available due to steep terrain.